First and foremost the music on this album may have been influenced by Serialism, in the way that the works of Webern also influenced Derek Bailey, but the music itself is not Serialist. The strict system, which that implies, needs rigorous planning and a disciplined but creative compositional strategy, with the very essence of this being at odds with an improvisational approach. In this way, it is not the actual system but the sound of the music that has sparked Ivo Perelman’s creativity as an improvising musician. 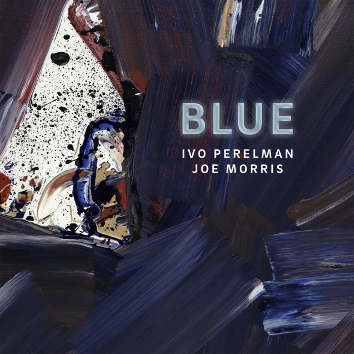 This album is about the colour Blue in all it’s connotations and meanings, it’s certainly not the ‘Blues’ in a structural sense (although there are melodic passages which hint at these stylistic traits) and as Perelman is also a very accomplished painter it seems that the blueness of the music is more fixed on the visual idea, whilst seeping over into more emotional responses. I very much like Perelman’s visual art and the winding contrapuntal lines of the music seem to be an audible manifestation of his more drip-like Jackson Pollock inspired pieces. 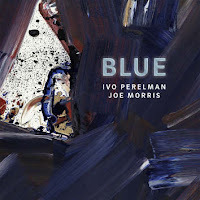 As an album of improvised duets between tenor saxophone (Ivo Perelman) and acoustic guitar (Joe Morris), this is the first time that Perelman has recorded with just these two instruments in an intimate setting, and one that he also had reservations about with regard to the viability of the project. However, he needn’t have worried and the music on the album is a triumph, once listened to carefully and with respect for what the musicians are trying to achieve. The title track starts the album and Perelman’s sax, with Aylerish-vibrato at times, carries the foreground melody whilst Morris’ guitar provides accompaniment mainly through freely atonal chordal voicing’s with interspersed linking single lines. This piece sets the overall tone for the album, which the rest of the music carefully continues with great consistency, such is its serial aesthetic. The second piece ‘Turtle Dance’ reminds me of some of Perelman’s ‘taking a line for a walk’ type paintings with the two complex lines of the sax and guitar criss-crossing over each other. This constructs a complex texture that appears more of a musical object, that we get to view at different angles, as opposed to a piece with an obvious structure that we follow on a journey through time. This is even more apparent on the shorter pieces such as ‘Bluebird’ and ‘Instant’ that come in at around the minute mark with their splashes of colour that also seem to have a clear parallel in the visual art of Perelman. Out of the nine pieces that make up Blue one of my favourites is ‘Wee Hours’ a track that starts with a husky melody on the sax with a guitar accompaniment that is almost playing a blues turnaround. The piece gradually and consistently develops with the simple lines becoming increasingly more complex before a bluesy melodic line marks the end of the sax’s input, with Morris’ guitar coming to the fore for a timbral and structural contrast before Perelman’s re-entry to bring the piece to a close. More ‘bluesy’ fragments are also on view (so to speak) in the piece ‘Almost Blue’ which is similar in it’s overall form to ‘Wee Hours’, also having the feel of an abstracted ballad and containing this feeling in it’s essence. The nature of the instrumentation naturally gives the album an overall introspective and intimate feel and there is clearly a link between Perelman’s thoughts as a painter as well as an improviser. As an inward-looking album, Blue doesn’t necessarily come out and grab you and it may take a while to tune-in to the dynamics of the pieces. However, the playing is subtle, complex and heartfelt, whilst the title sways your listening bias to hear passages that seem to have developed out of the Blues, of which there are clear moments. Blue is a consistent set of complex musical interactions with unique forms having been influenced by a Serial aesthetic.